Put 1 1/2 cups warm water in a large bowl, sprinkle yeast over the water then stir well to dissolve the yeast When the yeast is dissolved and frothing add sugar, salt& milk. Beat the two eggs and add to the bowl. Stir well and slowly add the 7 cups of flour. Stir until the flour is well mixed in and the dough is in a big ball, cover with plastic and place in the fridge overnight Next day roll small pieces of dough on a floured board. Roll as thin as you can and cut into 2" squares.Make a double slash through the center of each square. This helps the center cook through. Fry in 360F oil for about 3 minutes until light brown. 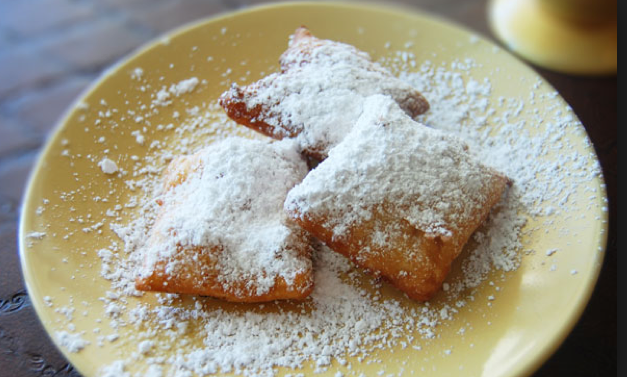 Shake the beignets in a bag in confectioner's sugar C'est Bon. We would like to offer you the following suggestions for your Beignet making endeavor. In a bowl, combine two cups of beignet mix with seven ounces of water. Be sure to measure your ingredients. Remember, sometimes it is hard to measure ingredients exactly. You may have to add a little more or a little less water to achieve a good beignet mix dough, and you may have to make more than one batch to get the hang of it. Mix the ingredients with a spoon until the beignet mix is all mixed with the water. The dough should be relatively soft, like drop biscuit dough. It should not be stiff like pie dough. Do not overmix the dough. You will have tough beignets if you overmix the dough. Scoop the mix from the bowl onto a well-floured surface. You will need additional flour to roll the dough flat; or else, the dough will stick to your rolling pin and your hands. Flour keeps the dough from sticking to everything. Be sure to use plenty of flour. Roll the beignet dough flat and cut into 2-inch squares using a pizza cutter. From around the edges, you will have scraps of dough left over. Do not try to remix these scraps and cut them into squares. If you do this, you will get tough beignets. Just fry these pieces just the way they are. Your cooking oil should be at 370 degrees Fahrenheit. At Cafe Du Monde, they use cottonseed oil, and we recommend you use cottonseed oil. However you may use any vegetable oil you wish. Remember that the temperature of the oil will drop when you add the beignet dough to the oil. Do not add too many pieces to the oil or else the oil temperature will drop and your beignets will be fry up flat. They will not puff up. The only other reason the dough does not puff up would be if you rolled the beignet dough too flat. Try rolling the dough a little thicker.